We have finally found out where all the older people in Newtown hang out. 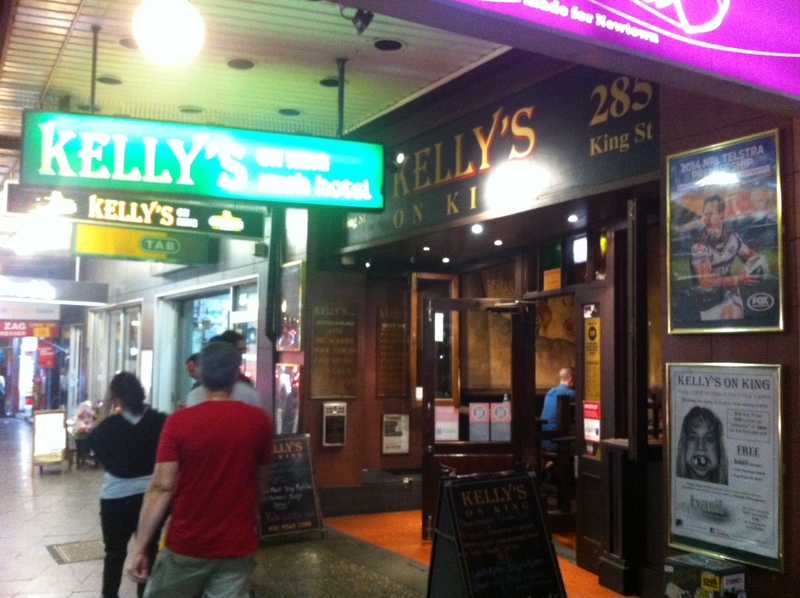 On Friday night, when it gets dark and the Young People come out to play, taking over King Street, with their tight skin and their tattoos, Kelly’s is a haven for us slow-walkers. It is the only pub left in Newtown where high-vis fluoro is not worn ironically. Once upon a time it may have been an attempt at an Irish theme pub but now it is more an attempt at a grungy rabbit warren. The place is full of nooks and crannys and sticky tables. But it is jolly, and as I said, on a Friday night it is the last refuge of the Older Person. There are plenty of screens showing rugby, and quite a lot of beer-gut and shaved-head combos (tempted to add “and that’s just the women” but I’ll resist). 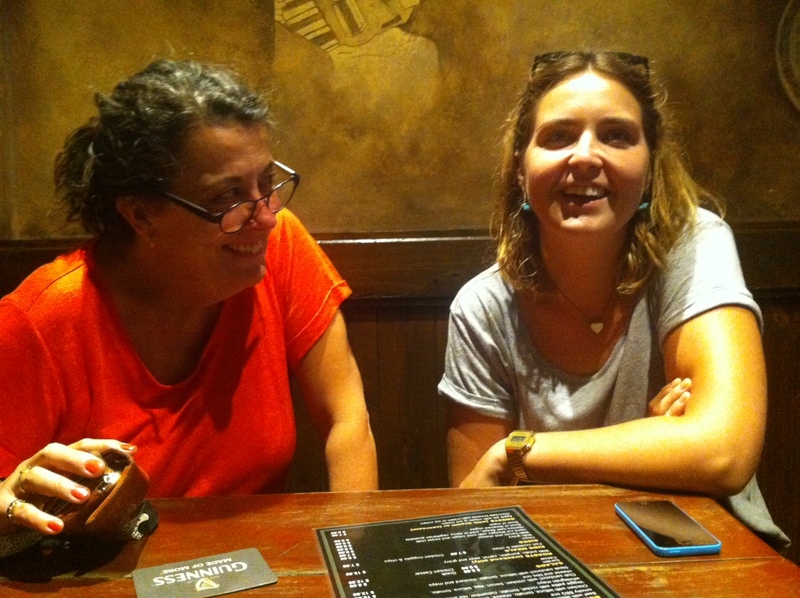 It is the kind of pub where the bar staff greet the regulars by name, and are surly to everyone else. The whole place has a kind of “yes we’re unfashionable, but if you don’t like it you know where the door is” attitude. Tonight it is crowded and noisy. Strop and the Stropolina have snagged a table halfway between the bar and the front door by the time I get there. There are kids running around, and being herded back to their tables by their parents as Strop gets the orders in. Coopers Pale and a burger for me, wine and Eggplant Parmigianas for the women folk. Strop is starting to develop a worrying disregard for the Rules. “I’m sick of burgers,” she says, leaving me to fight the burger wars on my own. Fine. I will then. While I’m sulking and taking notes, Strop and the Stropolina blather on in a womenly way about weddings, wedding gifts, school harmony days, getting down with the ladies, Jamie’s Italian, “it was good but we drank a lot of wine,” and Indian brow plucking techniques (I’m pretty sure thats what my notes say). Very soon we are startled by the rattle and flash of the bistro buzzer. That was quick. The women folk look after the food collection while I go hunting for more drinks. The burger is big and tasty, if a bit overdone. The whole thing is generous to the point of structural inadequacy. It requires a bit of fast fang work to prevent the works squeezing out the side. The chips are excellent and the aioli is hard to resist. I am beginning to think that the general standard of pub burgers is pretty good. I haven’t met one yet that I wouldn’t happily eat twice, but it can be a messy process. I’m starting to wonder whether I should add a bit of a review on the quality of the napkins. Kelly’s napkins are nice and absorbent. But wait, there is consternation on the Eggplant Parmigiana front. “Where is the eggplant?” says Strop. “It must be underneath the chicken,” replies the Stropolina. After some intense exploratory surgery, a complete lack of eggplant is revealed. I’m expecting Strop to storm upstairs and demand reparations be made, but all she says is “She must have got the order wrong.” I think she doesn’t want to deal with the surly barmaid again, either that or she is actually enjoying the Ordinary Parmigiana. The whole thing disappears quite quickly, and is a lot less messy to eat than the burger. Our shock and sympathy is interrupted by a huge islander guy shouting “Yellow 77. Yellow 77, for a free chicken.” It’s prize draw time, and of course we don’t win. We don’t even come within the same colour range, even though the draws go on and on. And on. They’re giving away a lot of meat here. I keep waiting for them to announce that they’re giving away a couple of eggplants. Afterwards we go in search of dessert and Strop discovers dark chocolate liquorice gelato. That makes her the winner for the night.